Services Product repairs, warranty, 7 days a week customer services. FUJIIRYOKI USA With over 200 showrooms around the world and 3 manufacturing plants, Fuji Medical Instruments Manufacturing Co. Ltd. has been delivering excellent quality, service, and products since 1954. Eight showrooms, under ACIGI, are located across the United States from California to New York. 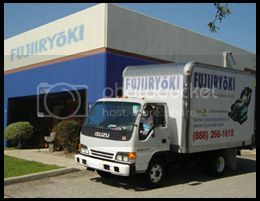 For almost 60 years, Fujiiryoki has been dedicated and committed to customer satisfaction and to customer health. Innovative, effective, and loaded with benefits, it is no wonder the Fujiiryoki brand is renowned worldwide and reputable. Fujiiryoki offers high quality and humanized medical, health, and beauty care products, such as the Cyber Relax medical massage chairs. Fujiiryoki's medical massage chairs and equipment have been the most popular in Japan, commanding well over 60% of the market and 35% in the United States. No reviews were found for ACIGI Relaxation.